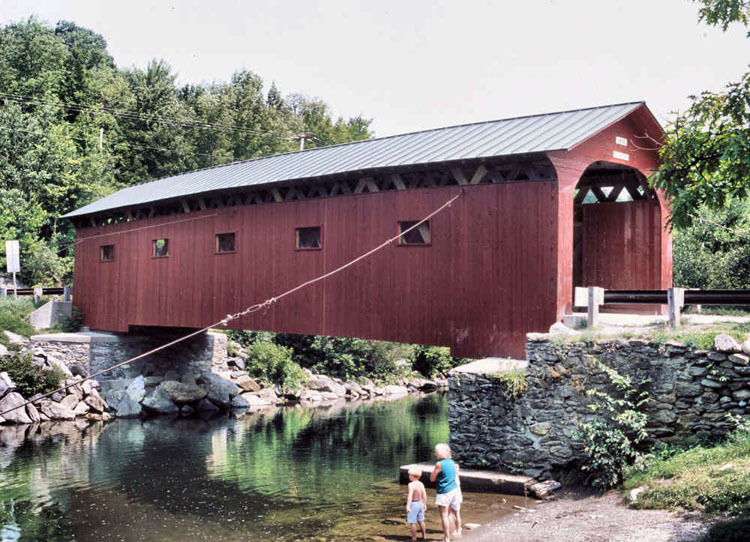 Postcards and calendars have made the Bridge-at-the-Green perhaps the best known covered bridge in Vermont. There is a great swimming hole here, and the base of the abutment provides a popular jumping-in place. Notice the cables, installed for lateral bracing. Our thanks to the Town of Arlington for allowing the posting of the Vermont Covered Bridge Society Welcome patch. For more information about the Arlington area visit their website at www.arlingtonvt.org. When in the Bennington area stop by The Bennington Center For The Arts and visit the Covered Bridge Museum. For more information about The Bennington Center For The Arts visit their website at The Bennington Center For The Arts.